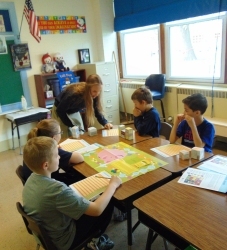 Queen of Peace High School Junior Achievement students visited kindergarten through fifth grade classrooms at St. Albert the Great and taught students life lessons ranging from how to contribute in their community to the importance of business and government in society. In preparation, the Queen of Peace students attended several training sessions to learn strategies that would help them create engaging lessons for their students. 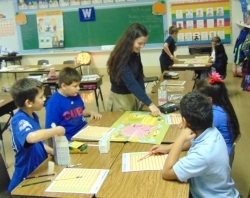 Briana Janczy, a senior at Queen of Peace, spent time with fourth grade students. “I taught two lessons both on entrepreneurship. One lesson was on what an entrepreneur is and identifying famous entrepreneurs. We also determined whether or not the students had the characteristics of these entrepreneurs. The next lesson was about starting your own business. 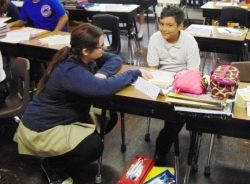 Students were assigned a region in the United States and they had to determine what they could make in that region to be a successful entrepreneur.” Junior Achievement of Chicago is an educational non-profit focused on bringing financial literacy, work readiness and entrepreneurship programs into the classroom. 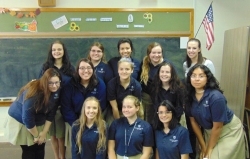 The Queen of Peace Junior Achievement students are: Karolina Nowobilska, Gia Spalla, Lauren Johnson, Elizabeth Hicks, Juliana Neiza, Emilia Vates, Andrea Martinez, Amanda Davilo, Briana Janczy, Nicole Muszynski, Bryanna Martinez and Brigid Mundt.